The heavy-duty scale for your parcel shipping needs. The legal for trade Mettler Toledo® PS90 shipping scale is the ideal choice for shippers that require a high capacity or an in-line scale with their shipping dock conveyor. It is available with a 300 lb capacitiy and your choice of stainless steel (flat), ball-top, or roller top platforms. 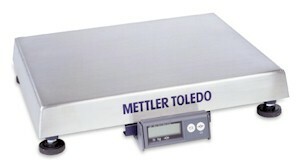 The Mettler Toledo® PS90 Parcel Scale is a member of the PS Scale Family. With it's 300 lb capacity it is the heavyweight of Mettler's PS Scale Family. If you weigh very heavy parcels or if you want to add a scale into a conveyor line, than this is the scale for you. It connects easily to a PC via an RS232 connaction and is compatible with all Shipping Manifest Software applications.